Our readers are constantly asking us for tips and travel advice for popular gay destinations so we’ve decided to create a series of guides to help inspire you and plan your visit. We’ve included just the top recommendations in this post but you can download the full version of the Gay Madrid guide for free. We’ve even included a mobile friendly version to take on the go! Madrid is perhaps not as well known of a gay destination as its Catalan sister in the northeast, Barcelona. But the truth is that Madrid is a bigger city with more offerings from a nightlife perspective and many LGBT oriented events throughout the year. Madrid is still a great destination for tourists, though it admittedly doesn’t have quite as many attractions as the architectural wonder Barcelona. Still Madrid is a fantastic destination especially if you enjoy local neighborhoods, art, the gay scene, nightlife and beautiful weather. Madrid is a vibrant city that doesn’t sleep and it’s not uncommon to see last nights’ partiers walking home at 8am in the morning while grandma is going for her morning walk. We’d argue it’s perhaps the gayest capital city in Europe, or at least contending with Berlin and London. Chueca is the center of the LGBT community in Madrid where you’ll find the highest concentration of gay bars and night clubs. Madrid is easy to navigate and the city offers great public transport with the metro, regional trains and buses. But it’s important to note that even given its size, Madrid is a very compact city. Most sites of interest are located in a small area of the city center. If you stay central, it’s possible to walk to some or even all of your destinations. The airport is located just 15 kilometers (9 miles) from the city center and takes about 45 minutes via public transport. The most economical route is to take the metro or Airport Express Bus. A taxi should cost about 25-30€ from the airport to the city center. If you are traveling to Madrid during high season (May to August), on the weekends or during major gay events, you’ll need to book these rooms in advance to ensure availability. Many of these properties are small and book quickly when in high demand. The Westin – it’s not a gay hotel by any means but they are a member of IGLTA and it is one of the more gay-friendly luxury properties located in the city. The décor is classical and it’s located in the southern end of the city near Retiro Park, the main Atocha Railway station and all the famous art museums. Rates start at 200€ per night. Axel Hotel Madrid – located in Atocha Street number 49, in the famous “Barrio de las Letras”, and it is surrounded by the most emblematic streets of the city, in a bohemian atmosphere that combines shopping, good gastronomy and fun. The hotel has 88 rooms. In Axel Hotel Madrid you will find a meeting point in the capital, with its innovative spaces made specially so you can treat yourself and have fun, always loyal to Axel’s concept of style, design, comfort and cosmopolitan environment. 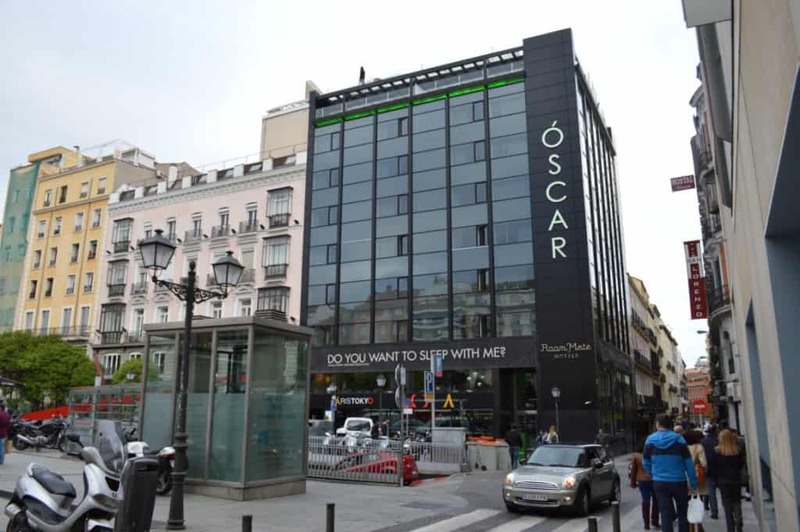 Oscar Hotel – there are countless places to stay in Madrid, but one of the most famous gay places is the Oscar Hotel. It’s not a “gay hotel” per se, but it attracts a lot of gay clientele and it’s located in Chueca, the heart of the gay neighborhood. The decor here is chic and modern but rooms book quickly during major gay events. Rates start at 100€ per night. You can also find budget friendly options at gay hostals in Madrid. Hostals are not to be confused with youth hostels. In Spain, a hostal is a small, privately owned 1 to 3 star hotel with private rooms and basic amenities. Rates are often as low as 30€ per night for a private room with a shared bathroom. Hostal Puerta del Sol – gay-owned and operated hostal and specifically markets to gay travelers. This property is located in the most central area of Madrid called Puerta del Sol, which is just 10 minutes walking south from Chueca. This location is still close enough to the gay nightlife but is also a bit closer to many of the famous museums and popular attractions in Madrid. Rates start at 40€ per night. 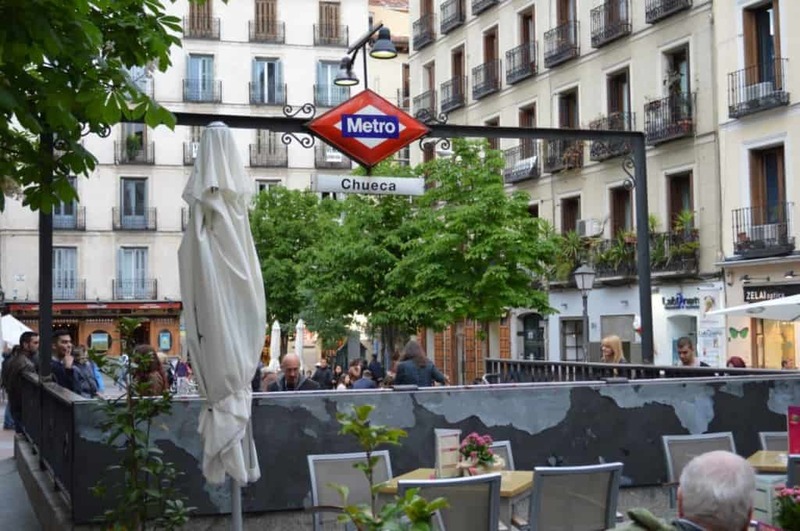 Hostal La Zona Madrid – a gay-owned hostal just beside the popular street Fuencarral, which is one of the most popular shopping areas in the city and right in Chueca. Single rooms during mid-week start at 35€ per night, which includes breakfast until noon. There are many sites for apartment rentals in Madrid, with AirBnB probably being one of the most popular. Prices are generally comparable to budget hotels, especially if you’re willing to get a room in a shared apartment. There are even a few LGBT-oriented booking sites like misterb&b with listings from gay hosts for gay guests where you can either rent a whole apartment or a private room in a shared apartment. Understanding Madrid’s gay scene is much more easily done with the help of a local and apartment sharing is one of the best ways to meet someone living in the city who knows how things work, where and when are the best nights to go out, and what places to eat at and which to avoid. 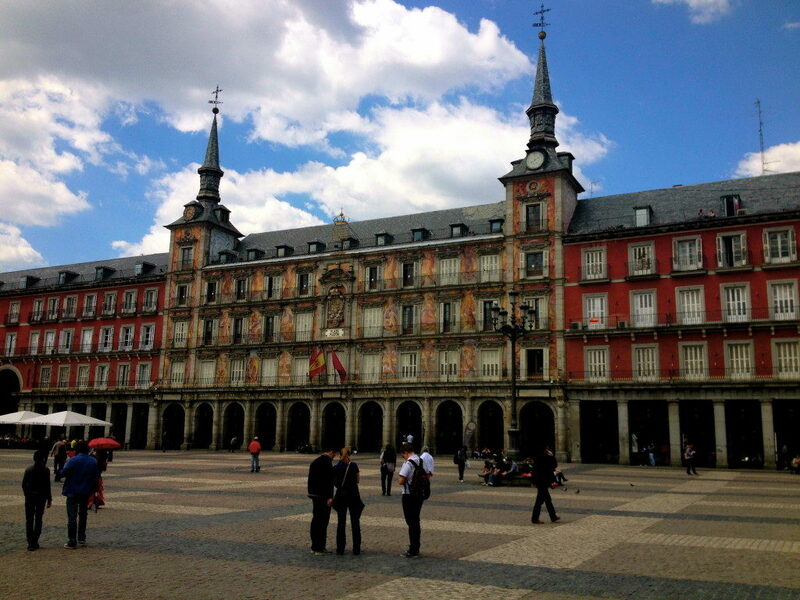 Like many cities, there are plenty of tourist attractions in Madrid – a city of more than 3 million residents. Though in our opinion, Madrid’s best attributes are found in the local plazas and small neighborhoods in the city center. Palacio Real – The former residence of the Spanish Royal family and the largest functioning palace in Europe. Tickets are regularly 10€ but they do offer free entrance in the evenings without a guide to select groups. Art Museums – Madrid is famous for its world class art museums with masterpieces from artists like Picasso, Dali and Goya. You could spend days visiting Madrid’s top 3 museums The Prado, The Reina Sofia and The Thyssen-Bornemisza. If you enjoy art you should pick at least one to visit depending on your tastes. Retiro Park – One of the most famous sites in Madrid and our favorite spot to take friends and family during a visit. Retiro, a massive park built in the 18th century, was originally reserved for royalty until the late 19th century. Calle Cava Baja – located a bit south in the La Latina neighborhood, this is probably the best place to go during the late evening to go bar hoping for tapas. You’ll find more than 40 places here serving some of the best the city offers. Mercado San Miguel – If you have time for only one market then it should be Mercado San Miguel. It’s located right in the center and has a rather posh offering of meats, produce, sweets, drinks of all sorts and of course tapas. There are a number of tours to choose from when visiting Madrid so it’s best to decide what you’d like to see and what level of service you want. Some of our favorites are listed below. Rainbow Tours Madrid – If you’re looking for a gay tours in Madrid, then we definitely recommend Rainbow Tours. We’ve done these tours in both Madrid and Barcelona and had a great time. They offer city tours as well as nightlife and pub crawl type tours with local gay guides that can answer any possible question about gay Madrid you could ever think of. Special Offer! You can save 10% on all Rainbow Gay Tours by using the code “TWOBADTOURISTS” when booking online. 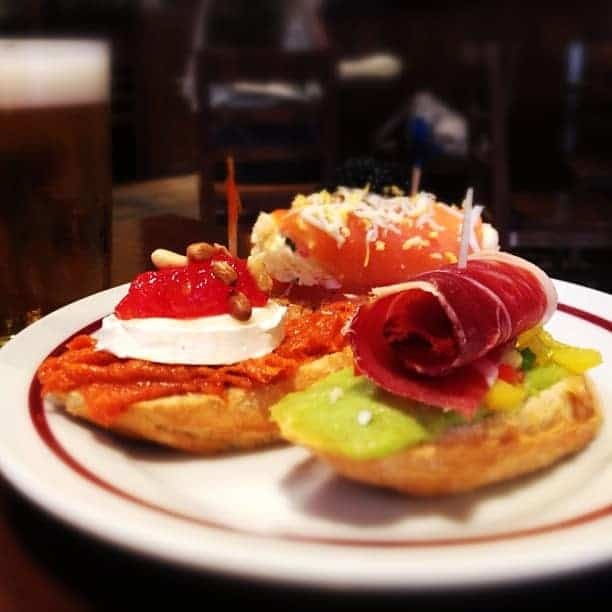 Devour Madrid Food Tours – If you really want to experience the food culture of Madrid with a knowledgeable guide, we highly recommend Devour Madrid Food Tours. We’ve taken a tour before and had a fantastic time sampling the cuisine at places we never knew to explore. They are constantly ranked in the top on Tripadvisor. Calle Fuencarral – The pedestrian street stretches from Gran Via north up for 500m with stores and shops of all kinds, not to mention plenty of cafes, restaurants and bars to take a load off during your busy shopping day. Gran Via – can find shops all along the route, but apparel stores are concentrated between Plaza España and the Gran Via metro stop. This is where you will find the higher end fashions along with your typical mid range big names stores like H&M or Zara. Depending on the time of day, there are several restaurants in and around Chueca worth a visit. You won’t be disappointed with the nightlife in Madrid. Many of these places are packed on weekends and some even offer a great time during the week, depending on when you’re coming to visit. Keep in mind that nightlife in Madrid starts extremely late, so don’t be surprised if you arrive at 11pm to a bar (1am at a club) and still don’t see a crowd. Just wait another hour and the place will get packed. Download the full guide for more information and drink specials. WE Party – monthly and usually held at La Riveria. Additional WE Parties take place during Madrid Gay Pride and New Years with parties happening every day during the week. Chocolate con Churros / Tanga – both are monthly gay party on Sunday nights. Usually starts early at 8pm since most people have to work Mondays. Parties will occasionally start later if Monday is a holiday. Location changes regularly. If you’re like us you’ll probably be stumbling from the club to your hotel around 5am and will be in desperate need for something fat and greasy to eat. The go-to drunk munchie food in Madrid definitely is pizza. You can find places open late in most of the central neighborhoods so keep an eye out on your stumble back. 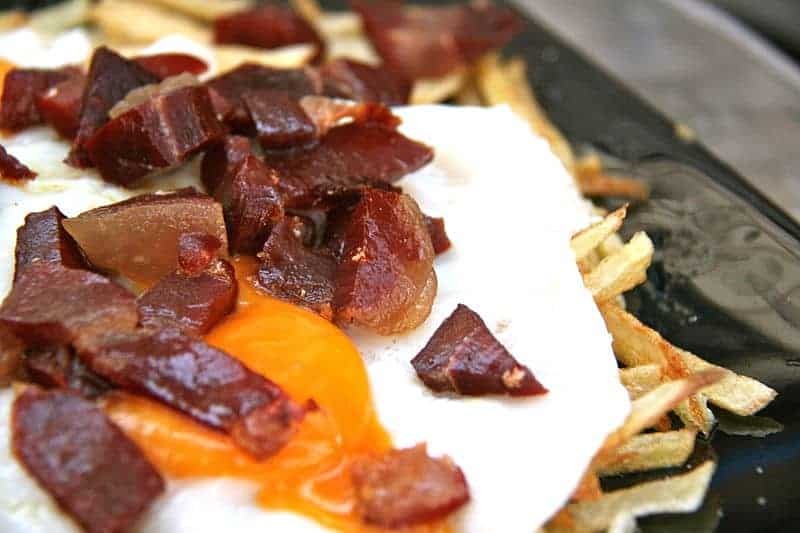 Our best recommendation is to find any place that serves “huevos rotos” – fried potatoes with a fried egg and ham served on top. Several places around Chueca that do actually serve brunch are Carmencita Bar, La Bicicleta and Café Oliver. Brunch is not customary in Spain, in fact Spanish people generally eat a light breakfast, or as David says…coffee and a cigarette. Either way, you can still find what you need. Besides hitting up the bars and clubs, you can find plenty of gays hanging around Chueca (the official gay neighborhood) as well as Malasaña, which is more of the unofficial hipster gay neighborhood. In the summer time, the gays head to the local public pool to sunbathe and drink sangria, located at metro stop Lago. Entrance to the pool costs 6€ and you can buy food and drink onsite. Each July, Madrid holds the largest gay pride in Europe with 1.5 million people in attendance. This is without question one of the most fun gay events of the year. Other events include the WE Party New Year’s Festival, MadBear, Sleazy Madrid and the LesGaiCineMad GLBT Film Festival. 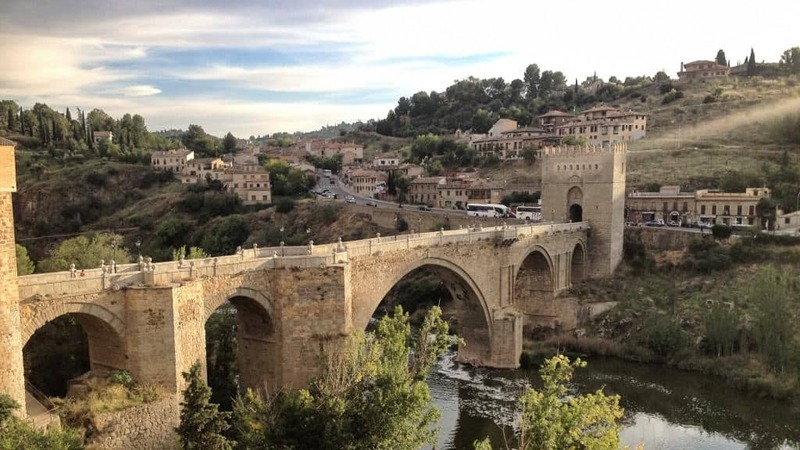 Toledo – Toledo is an easy day trip from Madrid just 45 minutes away. Toledo was once the capital of Spain until the 16th century when it changed to Madrid. It’s a perfect representation of the many religions (catholic, Muslim and Jewish) that have influenced Spanish history among the years of power shifting between cultures. Segovia – Segovia is a medieval walled town 1 hour north of Madrid. Originally a Roman town, it’s famous for its aqueduct (a UNESCO World Heritage Site) that spans from one side of the city to the other. Segovia sits on the top of a hill and its Cinderella-style castle hangs right off the edge of the cliff. El Escorial – Just 45 minutes from Madrid to the northwest is the famous city of San Lorenzo del Escorial. The city is known for its massive monastery and palace complex built in the 1600’s. To this date, it’s the burial grounds for 4 centuries of Spanish Royalty. Rainbow Tours Madrid even does a guided tour of el Escorial including the transfer. e.
Barcelona – Believe or not, you can actually do a day trip from Madrid to Barcelona. Thanks to the AVE, Spain’s high speed train, you can travel between the two cities in just over two hours one way. If you don’t have time for a full visit to Barcelona, but you don’t want to miss the highlights, check out this tour which gives you the opportunity make Barcelona a day trip from Madrid. We’ve got great tips and additional considerations for your trip in the full guide including things like finding the perfect portable smart phone charger, buying travel insurance, accessing a VPN, buying Eurail train passes and getting airport lounge access. What interests you most about Madrid? Would you consider visiting? Let us know in the comments below! Note: Some of these links are affiliates which means using them won’t cost you any extra but we do receive a small commission for each referral. You’re not obligated to use them but we appreciate it if you do. Thanks in advance for supporting this site if you choose to use our link! 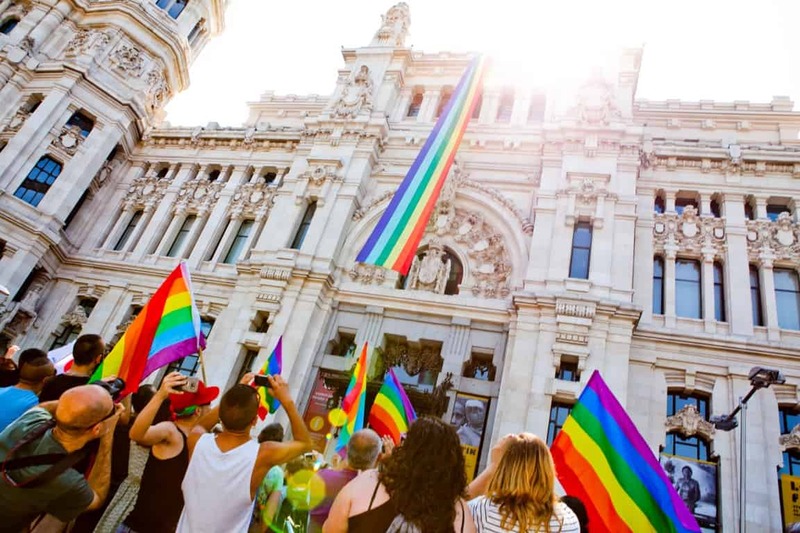 » Madrid Gay Pride Preview – Parties, Hot Bodies and Sun! On our first trip to Madrid more than 20 years ago, we took an extra week, rented a car and drove to Avila, Toledo, Guenca and Alarcon, staying at paradores in each place: a palace in Avila, a monastery in Toledo and a beautiful stone castle in Alarcon. It was an incredibly romantic trip and everyone we met was friendly and welcoming of these 2 obviously in love American dudes. That was the trip when we fell in love with Spain. We’ve been back many times since. In Madrid, be sure to see the Crystal Palace in Retiro Park, the black swans that congregate in the pond near it, and the bronze sculpture of Satan (I’m told it’s wild there on Halloween!). sounds like an amazing trip! 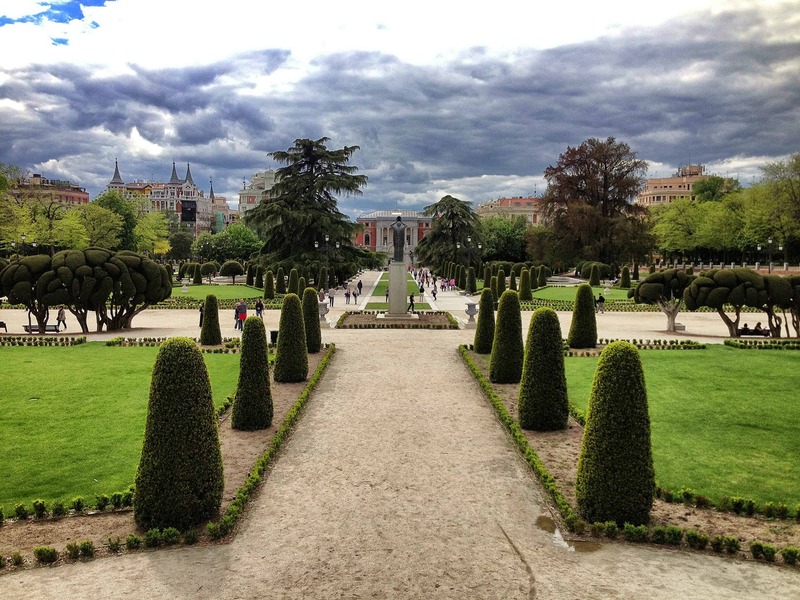 And Retiro…yes one of our favorite places in the entire city. Love taking afternoon walks or going for picnics on the weekend. | Is Barcelona Overrated as the Top Destination in Spain?